Why should the good things in us stop after death when there is great opportunity for life to continue after life? It is impossible to describe in words the emotional and physical trauma individuals with chronic organ failure experience. I am sure most of you have seen or come across someone whose life has been transformed for the better after organ transplantation. 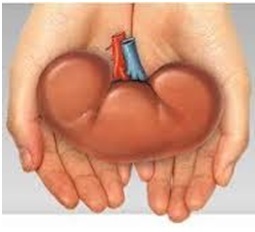 Kidney failure needing dialysis reduces quality of life and survival significantly. A patient in his/her 30s with kidney failure needing dialysis has a similar chance of having heart disease compared to someone in their 80s without kidney failure. 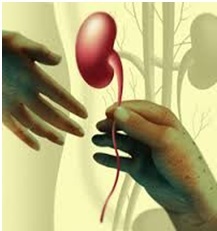 Dialysis replaces some of the functions of kidneys, but not all. Receiving dialysis is almost like having a part-time job; sometimes it can be more than a full-time job if we take into account all the dialysis-associated complications and procedures. To make matters worse, dialysis patients must adhere to lots of dietary and fluid restrictions. A friend of mine once told me that he only started appreciating the taste of water after starting dialysis. Kidney transplantation is the only treatment which can cure and improve the quality of life and survival in these patients. Yes, kidney transplantation is not without risks and patients have to take lifelong medications to suppress their immune system. But the overall benefits are far superior to being on dialysis. Survival of transplant patients and kidneys has improved significantly – half of the kidneys transplanted from living and deceased donors are still working at 15- and 10-years respectively. One of the immensely satisfying things to see for us as clinicians is to see patients leading a normal life following transplantation. With the exception of living donation, organ donation is only possible following a sudden, unexpected and most often premature death. We should never lose sight of the families who go through this and should do everything to support them. One of the ways to salvage something positive out of these dreadful events is through organ donation. Three patients die everyday in the UK waiting for an organ. 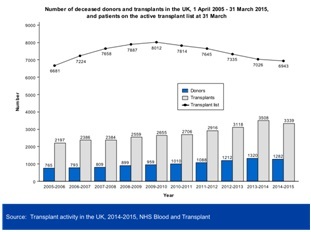 Over the last 10-years, the number of transplants being performed has increased substantially. 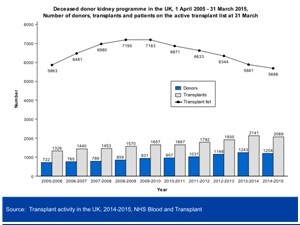 Still, a huge gap exists between the numbers of patients active on the list and the number of patients being transplanted (see graphs below). The current UK strategy for organ donation and transplantation, Taking Organ Transplantation to 2020, emphasises the pressing need to reduce family refusal rates. It is disappointing that there has been no improvement in the overall consent (or authorisation) rate in 2014-15. 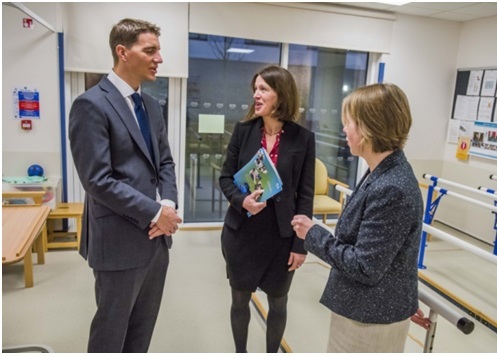 NHS Blood and Transplant continue to devote considerable attention to improving the support that it is giving to families when the possibility of donation is raised. On 1st December 2015, Wales became the first UK country to introduce a “soft opt-out” system for organ donation. It will be interesting to see what impact this will have on the number of transplants in Wales in specific and subsequently, the UK as a whole. Earlier this year Scottish government said it would consider bringing forward new legislation on an “opt-out” system for organ donation. Hopefully one day in the near future we will see an “opt-out” system in whole of UK, for the benefit of our patients with organ failure. Do we want to live as long as modern medicine allows us, or only so long as life is sweet? Death is our only shared destiny, but we are in a new era; it’s not unusual to have 70-year-olds looking after a 90-year-old parent. A few years ago we had to reorganise the shelving in the general practice where I work in order to accommodate the notes of our octogenarians and nonagenarians. In 1917, King George V sent out 24 messages to people having a 100th birthday. In 2011, the Queen sent 9,736. This is worth celebrating. Just before Christmas, I was languishing in a long queue at the Post Office where a 93- and a 94-year-old were holding court, debating the standards of humour in the greetings cards display to such uproar that the postmistress had to pause to wipe tears of laughter away. Age does not mean a loss of fun, vivacity, or pleasure in living. But age is still the most potent risk factor for death, and many older people at the end of life have its quality impaired by loneliness and, frankly, too much medicine. If we want good living right up until we die, we should be examining what makes it good — and what stops it being so. At the heart of the problem is the difficulty in predicting death. There is good evidence that doctors overestimate how long people who are known to be terminally ill will survive: we have libraries stuffed with research papers, but no crystal ball. This matters because medicine is often conflicted over the question of preserving life at the cost of its quality. Treatments in hospital might reduce the size of a cancer, but prevent the patient from going home, where she’d prefer to be. Medication for the heart might cause fatigue or dizziness but give extra weeks or months of life. But if this means less walking and independence, is it worth it? 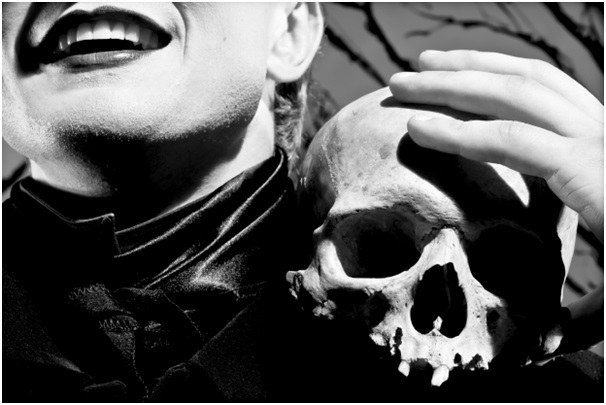 Death is inevitable, but frequently seen as an inadequacy in medicine or treatment. Harpal Kumar, the chief executive of Cancer Research UK, said on the radio recently that his aim was to ensure that no one died of cancer any more. But we are still going to die, so what are we to die of? Is every death to be fought back with all of medicine’s might, and to be always considered its failure? Frailty is often rapidly recognisable: low levels of activity, a loss in muscle mass, weakness, falls and easy tiredness. The months and weeks before death in an older person are frequently characterised by a series of crises, caused by something as seemingly small as a urine infection or a trip. But the background of frailty means less recovery each time, and a slow, or stepwise decline. If ageing is the cause of frailty, how can we treat it? Medicine has moved into a new era of riskfactorology. We are no longer concerned about people who have a disease, but people who have a risk factor for a disease. We search for blood pressure or cholesterol levels which are deemed high enough to then lower, to try to prevent heart attacks or strokes. We look for bone-thinning, in order to prescribe medicines to attempt to strengthen the bones and prevent a fracture; we offer flu vaccination to everyone over the age of 65. All this results in more medicines being prescribed and taken. This might sound so reasonable that the mechanism GPs work to (monetary carrots for adhering to targets and shameful sticks whipped out by the Care Quality Commission when we fail to reach them) seems OK. But our riskfactorology results are for the risks and benefits for populations, not individuals, and the result is thousands of people being prescribed medication that they will never benefit from. Take the medications designed to prevent osteoporosis, tablets called bisphosphonates, such as alendronic acid. These are taken by over a million people in the UK, usually once a week. Ideally, they prevent hip fractures or collapses of the spine. Hip fractures in frail older people can precipitate death, and are to be taken seriously. However, these medications usually don’t work. For example, the independent Cochrane Collaboration has found that for women with low bone density, or who have already had a fracture in the spine, long-term use of alendronic acid can cut the risk of hip fracture from two to one in 100. 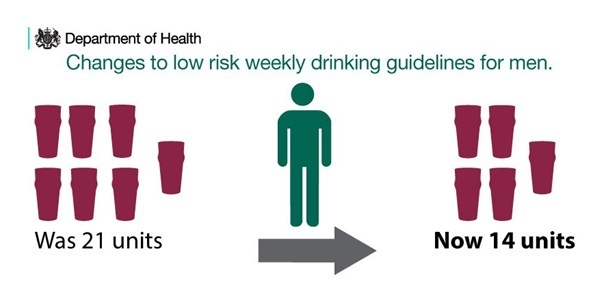 This is only a small reduction, although it can be described as a ‘halving’ of risk. What about side effects? Some women will get none, others will feel sick and nauseated. Some women dread the day they take the tablet and feel they have to write it off. Some will consider that a price worth paying, others will not. However, people aged over 65 are on an average of two drugs, and 10 per cent are taking five or more. In medical terms, this is an alarm signal — is this combination of medicines really doing more good than harm? Older people are chronically under-represented in clinical trials. So there might be trial data to show that a drug works pretty well in a 40-year-old — but will it have just the same effect in an 85-year-old? Our kidneys and liver — which metabolise our medication — tend to work less well as we age, meaning that standard doses can become toxic. And the drugs can interact with each other. Our nervous system is partly composed of unconscious nerves, controlling our heart rate, digestive systems and blood pressure. Many drugs have an effect on these nerves — from antidepressants such as trazadone, to medicine for diarrhoea like loperamide, to oxybutynin, for the bladder, and many antihistamines. The effect can be cumulative, risking falls and memory problems. It’s this constant play of harm versus advantage, pro versus con, that characterises much medicine, taking in Shakespeare’s sixth and, then, seventh stages of life. Frailty is a risk factor for death, but most frail patients will not die that year. As a doctor trying to decide which prescriptions are worthwhile and which are not, I’m also keen that I try to understand what matters to patients. Is this side-effect worth it? Is this medication keeping you well or causing you problems? Medicine can do great things — joint replacements can add life to years, heart attacks are treated with swift declogging of arteries, HIV can be managed long-term. But life through a medical prism is prone to give a medical answer to social problems. Loneliness is one of the biggest. Up to 16 per cent of our elders describe themselves as lonely. I’ve come across patients where the only conversation they’ve had all week has been with the doctor. People who are lonely are more likely to use NHS services, and loneliness is a risk factor for depression and earlier death, as big a risk factor as obesity or high blood pressure. Research points towards social interaction being protective against memory loss. Good health at the end of life is not just about medicine; it is about social activity and networks. So where do doctors fit in? Just before Christmas there was a sudden (and, sadly for me, temporary) lull in the demand for appointments. Instead of the usual ten, I could spend 20 minutes with just one patient. I had a joyous couple of days, because I could look away from the computer, relax and listen without the constant narking pressure of running late. Suddenly, there was time to talk about what really mattered. With this illness, what are you thinking about the future? Is there anything that is worrying you? What are you enjoying just now? What do you hope for? Unleashed from the tickbox demands of the contract we GPs work to, general practice is fascinating, uplifting and profound in its humanity. Listen, and people talk. It’s clear from the research that the vast majority of people with life-limiting conditions want their healthcare professionals to play it straight — most people want honesty. This does not mean that people should be told brutal truths in one unexpected sitting. It does, though, mean that talking about death and what quality of life means — for you — should be an unfolding, commonplace conversation. This is hard, not just because it can feel awkward or upsetting. But the problem is plain. Medicine has a habit of almost unstoppable escalation. One treatment leads to a side effect, which can lead to another treatment, which can lead to another side effect: we can end up chasing tiny odds of benefit while the problem, staring us in the face, is that death is going to happen at some point no matter what we do. Too much medicine is capable of changing a peaceful death into a medical battleground, a peaceful death surrounded by family at home into a death in the bright lights of intensive care. Stepping off the medical escalator may take courage, not just for patients and families but also for doctors. Until we value a good death as much as we value a good life, we will fail to serve people well at the end. Dr Margaret McCartney is a GP in Glasgow and writes regularly for the BMJ and other publications.